Scottish patriotism? Absolutely. A preference for Scottish historical figures over English ones? Understandable. A slight bias against the English for their treatment of the Scottish people and nation? Sure. 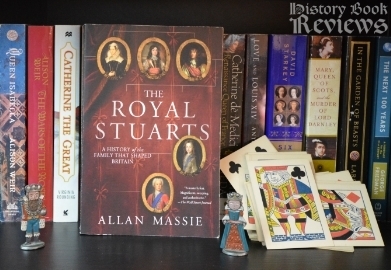 But what Allan Massie has created in The Royal Stuarts? Never!!! Massie's book comprises a history of the Stuart family line, from beginning to end. The Stuart dynasty came to rule England and a united Great Britain in the beginning of the 17th century and came to an end with the death of Queen Anne in 1714 (for a great biography of this last Stuart monarch, check out Queen Anne by Anne Somerset). Massie devotes one chapter to each monarch, from the first Stuart who ruled Scotland in the 1400's to the questionable "reign" of Bonnie Prince Charlie in the 1700's (since the Hanover dynasty had already gained control of the throne). I was excited to read this book because I don't know a lot about this period in England, and many of the monarchs who ruled then are shadowy figures for me. Unfortunately, after reading it, I still feel like I know little about it. I think all historians and people who undertake writing serious history books deserve respect, and I applaud their passion since I know how rare it is, so I really hate to say anything mean about them. But The Royal Stuarts was reallllllly boring. And that's coming from someone who reads the Complete Works of William Shakespeare and ancient Latin poetry for fun. The worst part is that I can't put my finger on exactly WHY it was so boring. I think it's because the book covers such a broad topic and there is really not enough space to fully discuss each character. Also, Massie throws in so many events, names, dates, and royal acts that there is little room left for any personality of the monarchs to show through. After forcing myself to finish it I have a vague memory of which ruler came in what order (although this is not a hard task, since more than half of them were named James and they went in chronological order), but I can hardly remember who did what or any distinguishing facts about most of them. There are so many fascinating characters and events in this part of history that it should be almost impossible to make it boring, but somehow Massie accomplished this feat. his 40's, contrary to what most people think. But that wasn't the worst thing. Throughout the book Massie dropped hints about his own Scottish heritage, and his author's note confirmed it. I can fully understand Scottish bitterness toward England for the way the English treated the Scots and made war on them for centuries. But bringing that bitterness into a scholarly work is unprofessional and kind of discrediting. It really came out in force on the chapter about Mary, Queen of Scots, who was imprisoned and executed by Queen Elizabeth I of England (her cousin). Massie was overwhelmingly defensive of Mary, to the point that every contemporary description that was favorable to her he called "probably accurate" and all the negative ones he called "unreliable". These are hardly ever backed up with any kind of explanation, and left me wondering where on earth he got his scale marked "accurate" on one end and "contrived" on the other. Not to mention that he had some kind of personal vendetta against Henry VIII, calling him an "old ogre" who "contrived to destroy any chance of success by characteristic brutal stupidity". I actually felt insulted by this blatant unjustified attack on Henry. For one thing, how can anybody purposefully destroy their own success because of their stupidity? That implies that his actions were intentional and unintentional at the same time. 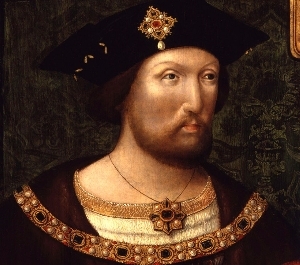 Would it really be so hard to assume that Henry was a human and had a rational reason for acting as he did, and that perhaps he made mistakes or had faults like all the rest of us???? Ahem. Enough of my rant. The highlight of this book for me were its anecdotes, although only a few were memorable. One of these was an account of James I's courtly revelry, with a pageant featuring aristocratic women as Faith, Hope, Charity and Victory. Unfortunately for the production, everybody was drunk beyond belief, and the ensuing scene of girls crying, people tripping and falling on top of each other, and brawling would be eerily familiar to anyone today who has been in a nightclub around 2 am. Ultimately The Royal Stuarts was boring. There was little connection to the characters and little organization to the individual chapters. It was frustrating to find certain characters vilified for no explained reason and others put on a pedestal, again for no supported reason. I would be among the first to applaud Scottish heritage and pride (mostly because of Highlander...the tv show, not the movies), but this emotional favoritism and lashing out is unprofessional and does not belong in a history book. Also there is not a single picture or plate! That's almost unheard of in modern history books! Massie obviously put a lot of research and effort into this work, but unfortunately in my mind there is little to like about it. I feel sure the Stuart line and its individual monarchs are covered better elsewhere (even Wikipedia! ), so I would encourage readers to look elsewhere and not waste any time on this particular book.